The Myanmar dairy industry has been growing over the past few years as access to electricity, which is essential for the development of the sector, improves, U Khin Maung Win, chair Myanmar Livestock Federation, told The Myanmar Times. The Yangon government has threatened to sue a local real estate company for collecting fees from vehicles that pass through its compound, Yangon Mayor U Maung Maung Soe told parliament on Monday. Myanmar set up a committee to discuss reforming the country’s military-drafted constitution on Tuesday (Feb 19), pitting Aung San Suu Kyi’s civilian government openly against the powerful armed forces for the first time over the incendiary issue. Myanmar’s famed Inle Lake has enchanted tourists for decades with its floating gardens and the graceful leg-rowing style of its fisherman, but experts warn the lake is drying up and urgent action is needed to avoid disaster. Myanmar will raise efforts to boost trade with the Republic of Korea, said U Aung Soe, Permanent Secretary of the Ministry of Commerce (MOC) during an event to promote local agriculture exports to South Korea on February 16. Myanmar’s Union Parliament on Tuesday announced the formation of a joint committee for amending the 2008 constitution. 19/02/2019 Nay Pyi Taw The Government of Myanmar and the UN’s Food and Agriculture Organization (FAO) today signed a multi-year framework agreement that will create an enabling environment to improve nutrition and food security in Myanmar, while safeguarding and sustainably managing the use of natural resources. A housing project to be built in Yay Tagon Taung in Mandalay Region’s Patheingyi township is expected to create tens of thousands of jobs, said the company behind the project. Japan will help Myanmar tackle a refuse issue that has created a headache for its largest city of Yangon, NHK world reported. The value of Sino-Myanmar border trade through the Muse checkpoint as of 8 February in the current financial year (Oct 2018-Sep 2019) showed a decline of US$585 million compared to the year-ago period, according to data released by the Ministry of Commerce. Myanmar Awba Group (Awba), Mercy Corps, and Golden Sunland have formed a coalition with the objective of improving the livelihoods of paddy farmers in Labutta town, Ayeyarwady region, via a project called Link to Labutta Market. A court in Dawei township, Tanintharyi Region, has fined the chief editor of Tanintharyi Journal K500,000 (US$326) on Monday for an article it published on November 20, 2017. A UK cabinet minister highlighted how Myanmar’s garment industry is supporting the livelihood and security of vulnerable women. Some lottery shops had lowered the price of K1000 lottery tickets as the demand for the K1000 lottery tickets is low, according to sales agents. Construction of the eastern part of Yangon elevated expressway will start in early 2021, said Deputy Director General Kyi Zaw Myint from Road Department under Ministry of Construction in a meeting to discuss about the environmental impact assessment concerning the project in Hlegu Township on February 18. Myanmar’s parliament on Tuesday approved the creation of a 45-member joint committee to write a bill to amend the army-drafted 2008 constitution that the current government views as undemocratic, despite opposition by lawmakers from the military and the main opposition party, legislators said. The meeting between government and northern allies was possible to be held this month but has been postponed for a couple of days, said San Aung, a member of Peace-talk Creation Group. Loudspeaker noise drifts from a back street in the wee hours of the cold season in Taunggyi – not from someone asking for donations, as is so often heard in Yangon, nor from a song. Instead, it is a notice that garbage is being collected. Renovation work on earthquake-hit pagodas in Myanmar ancient heritage sites is nearly complete, leaving only 20 pagodas still under restoration, said the official Global New Light of Myanmar on Tuesday. More than 200 refugees from Paletwa township in Chin State who fled to Bangladesh from fighting between the Tatmadaw (military) and Arakan Army (AA) on February 3 are stranded at the border and need aid, said U Win Thein, head of the Refugee Rescue Committee of Bangladesh. Eight ancient cities including Innwa and Amarapura, need urgent conservation and if there is no conservation efforts placed on to these cities right now, they are in danger of being destroyed in a 10 years period according to Thura Aung, Secretary of Archeology and Research Association of Myanmar. 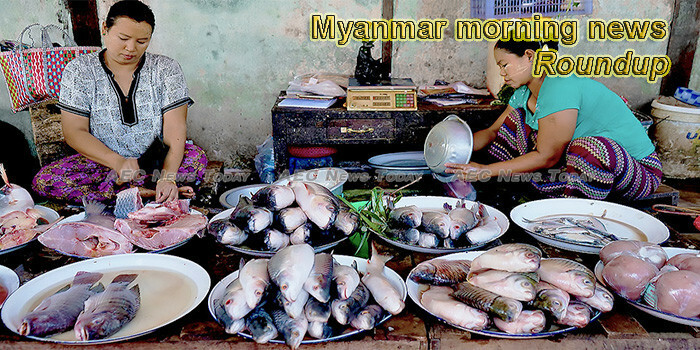 Tucked in the predominantly Buddhist Bamar community in Sagaing Region is a thriving Christian village inhabited by people of Portuguese ancestry dating back to the 15th century during the reign of Inwa King Anaukpetlun. DRIVEN by surging demand from European and South American buyers, Myanmar’s leading manufacturer and exporter of rattan, bamboo and lacquerware products plans to ramp up production and sales in the next few months, according to StellabethSwezin Le, director of business development at Bella Interiors Co.
At first glance, it appeared like total mayhem in the city centre last Sunday – cranes were on the streets, electricity cut off, police and security personnel everywhere. There were also an ambulance on standby and a crowd of people gathering. The Myanmar military on Tuesday denied an accusation by the rebel Arakan Army that it has been using passenger buses and cars to transport its troops in western Myanmar’s Rakhine state, where the two forces are fighting each other, a national army spokesman said. The UK-based Institute of Risk Management (IRM), a leading body for professional Enterprise Risk Management (ERM) services, has accredited the Myanmar Institute of Governance and Management (MIGM) the Fundamentals of Risk Management (FoRM) training provider licence, according to the firm’s release on Tuesday. Asia Frontier Capital’s Regional Investment Analyst Scott Osheroff recently traveled to northern Myanmar to visit the mine site of one of its portfolio companies. University of Yangon is a leading academic institution in Myanmar and its leading role is keen to bolster capacity in all areas including regional and international collaboration.